"I have no plants in my house. They won't live for me. Some of them don't even wait to die, they commit suicide." Using heat from a forge that turns out car parts and hand tools, a Michigan manufacturer is developing an energy-efficient way to warm a year-round greenhouse on the company's roof. David Moxlow, president of Trenton Forging, started growing fruit and vegetables atop his plant southwest of Detroit in November; he has already harvested greens, peppers, broccoli, strawberries and tomatoes, which are shared with employees and visitors. The company is among a number nationwide that are developing technology and techniques for rooftop gardening as interest in local and homegrown food grows. Sky Vegetables aims to build hydroponic farms on roofs in New York and Washington and in the Boston and San Francisco areas to make more fresh produce available in cities. Another company based near Chicago, GreenGrid Roofs, sells a modular system of plastic bins that make it easier to install rooftop beds. Rooftop gardens provide environmental benefits similar to traditional green roofs, in which plants are used to reduce storm-water runoff, filter pollutants and cut heating and cooling costs. The gardens also can make it easier for city residents to get fresh fruit and vegetables, which is seen as a way of improving public health. 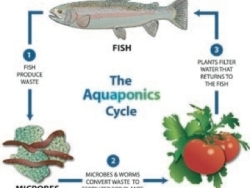 Aquaponics is an integrated aquaculture (growing fish) and hydroponic (growing soilless plants) system. First, the waste from fish tanks is pumped to a section of the system to be treated with a natural bacteria that converts the waste--which is largely ammonia--first to nitrite and then to nitrate. At that point, the fish waste is in a state that can be used to feed the plants. The fish wastewater is then pumped to a media bed or other hydroponic system to be used as nutrient solution by the growing plants. Aquaponic systems are gaining popularity and can be used to grow food for personal use or for commercial production. The most popular fish grown in aquaponic systems is tilapia. However, some growers have had success growing largemouth bass, perch, carp, crappies, bream, and some ornamental fish such as koi and goldfish. The plants that are traditionally grown in these systems are lettuce, other salad greens, and succulent herbs such as basil. Some commercial systems that feature densely stocked fish tanks can grow tomatoes, cucumbers, peppers, and even melons. Most aquaponic systems are located in a greenhouse. However, some systems can be located outside in temperate or tropical locations. Some growers even locate small aquaponic systems indoors next to a sunny window or under artificial lighting. Several companies exist that sell prefabricated aquaponic systems. However, many creative, enterprising growers are building their own systems. To learn more about aquaponics, The Growing Edge magazine and Web Site regularly feature articles and information on aquaponic growing. Aquaponics is a growing field and has really caught on over the last several years. If you're interested in growing both fish and plants--either for personal use or for a career--you might find that it's an ideal method. Sounds intriguing and would be a fantastic setup, right? A word of warning: aquaponics can be very tricky indeed. Start small and do lots of homework first! What plants are NOT well suited to hydro? Corn, zucchini, summer squash, melons. Sure they can be grown in a hydroponic garden, but they are space hogs, and just not practical. They will take over your whole unit. Your resources are better spent on crops more suited to the compact systems. Think small for now--- bush or patio strains of beans, tomatoes and cucumbers.